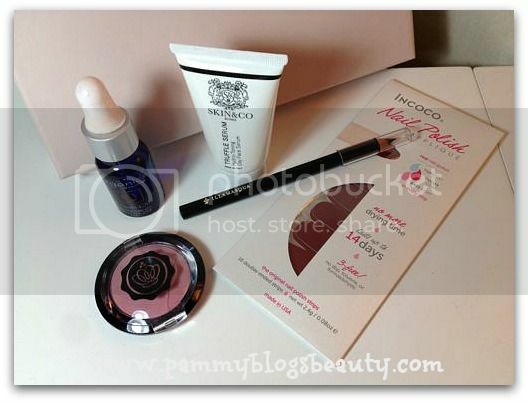 Pammy Blogs Beauty: Tis The Season to be Glossy: GLOSSYBOX December 2012 Box Opening! Tis The Season to be Glossy: GLOSSYBOX December 2012 Box Opening! 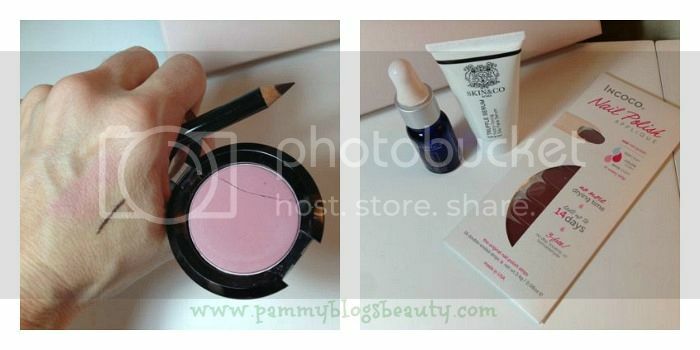 For those of you unfamiliar with GLOSSYBOX, here is the scoop! GLOSSYBOX is a luxury monthly Beauty Box Sample Subscription. For $21.00 per month, you get a a lovely box of 5 deluxe beauty samples. The best part? One of the "samples" will be a full-sized item! You also get to earn reward points with GLOSSYBOX. When you give GLOSSYBOX feedback on your GLOSSYBOX samples or when you invite friends to GLOSSYBOX through email, you earn "Glossydots". There are no referral links available just yet. So, email is really your only way to earn points through people signing up. What do you do with these Glossydots? Well, when you collect 1,000 of them you can apply them towards getting a free Glossybox. If you are curious about what is inside the December GLOSSYBOX, please keep reading! *edited: This might have been the November box? However, it arrived for me in December. Just wanted to make a note of it! I realize this as I got another GLOSSYBOX at the end of December that was Christmas themed as well. Sorry for the confusion! With the arrival of the Holidays, GLOSSYBOX wants you to get gorgeous with our top beauty picks to make you a standout among the crowd of little black dresses. Whether you are attendingthe office fete, family gathering, or holiday party, the latest collection of products from soothing to hydrating to colorful and fragrant, will keep you looking fabulous from day to night. Also, GLOSSYBOX wants reminds us that GLOSSYBOX makes a great gift! I must say that I agree. If you have the extra $21/month in your budget, a monthly beauty sample subscription could make a really great gift! It is the gift that keeps giving each month! I think it is a fabulous gift of luxury for women of all ages. I know that it would be a gift that I would love to get. What is inside the box? Lets get to it! Illamasqua | Lip & Eye Medium Pencil in Honour (I *believe* that this is a full sized pencil? It is pretty big none-the-less. Full size cost $20): Every girl needs a good brown eyeliner. Brown is my standard as black typically looks a bit too harsh with my fair skin and blonde hair. Designed to glide over your skin and create a long-lasting highly pigmented finish, this creamy pencil lets you write a different story with every look. Use it to create sultry eyes. Incoco | Nail Polish Applique (Full Sized! Cost $8.00): I really like nail polish strips! Plus, any sort of nail polish-related item in a beauty box is a plus in my book! I got the color Sinderella which is a beautiful shimmery deep blue-based red. These polish strips will look gorgeous for the Holidays! I have never heard of this brand before. So, I am excited to try these. A nail applique strip made of 100% real nail polish including base, color, and top coat for brilliant, long-lasting results. NuMe Style | Arganics by NuMe Argan Oil (sample size 10 ml, Full sized cost $59 for 4 oz): I love Argan Oil! So, I am thrilled that there is a nice deluxe sample Argan oil in my GLOSSYBOX! Argan Oil is one of those all-purpose and all-around amazing products. Great for your skin, hair, cuticles...anything that needs moisture! You only need a small amount to be effective. So, this deluxe sample should last a long time! A perfect compliment to any hair and skin care regiment, this Argan Oil is rich in Vitamin E and other beneficial fatty acids. Skin & Co Roma | Truffle Serum: Hydro-Toning Day Face Serum (sample size 0.50 oz, Full sized cost $36): I can always use another serum sample. This one is a very generous deluxe size! Give your face a boost and slow down the signs of aging using this Italian serum infused with Peptides, pure extracts of Tuber Melanosporum and Hyaluronic Acid. "Extra" NuMe $100 "Gift Card" Certificate: GLOSSYBOX threw in an "extra" coupon. It is a $100 "Gift Card" from NuMe. I went to the NuMe site to investigate this "Gift Card" to see how it works on the site. You can only use the discount code towards styling tools. Their tools mostly start around $150. So, it is a great discount. However, you are still going to have to pay a pretty significant amount to get a tool. If you are looking for a deal, I actually have their Zebra mini flatiron and I see it is $115 on the site. So, with the code, you could get that item for $15. Not bad! (check out my review of that item here: NuMe Zebra mini travel iron). I still take that little iron with me every single time I travel! I am very happy with this month's GLOSSYBOX! It is a nice mix of full sized products, deluxe sized samples, and even a good discount code extra! I am looking forward to using and testing out these products. As always, the packaging and presentation of the GLOSSYBOX is stellar. There is no question that the items inside make this box an incredible value for $21.00. The value of the items far exceeds the cost. Plus, it is a fun way to discover new things. GLOSSYBOXers, what did you get in your box? Wow, looks like Glossybox is the way to go! Do You think you will be using your NuMe code? I've heard a lot about them but have a hard time spending that amount (plus shipping) on a tool. I mean, is it even worth it? I have to admit.. I'm totally tempted though. If you don't plan on using your code let me know, I would love to try them out!